Dr. Charles Alcock is Director of Harvard-Smithsonian’s Center for Astrophysics in Cambridge, Massachusetts, a collaboration of Harvard College Observatory and Smithsonian Astrophysical Observatory. He was educated at the University of Auckland, New Zealand and at the California Institute of Technology. 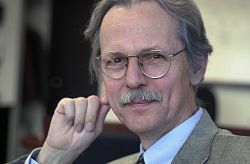 He has previously been a long-term member of the Institute for Advanced Study (1978-1980), an Associate Professor of Physics at the Massachusetts Institute of Technology (1981-1986), a physicist at the Lawrence Livermore National Laboratory (1987-2000), and a Professor of Astronomy and Physics at the University of Pennsylvania (2001-2004). He assumed his position as Director in 2004, and served as Acting Undersecretary for Science for the Smithsonian (2008-2009). Professor Alcock received the Department of Energy’s Ernest O. Lawrence Award for Physics in 1996 and the Beatrice M. Tinsley Award of the American Astronomical Society in 2000. He was elected to the National Academy of Sciences in 2001 and to the American Academy of Arts & Sciences in 2006.